The choice of wedding venues in Essex is not an easy one and warrants as much attention as choosing a gown or the theme. Some brides are lucky to find the spots they love on the first attempt, but others have to try a bit more. Whichever category you fall into, attending an open day gives you useful insights before making the final decision. 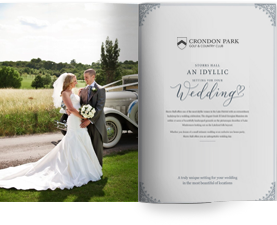 An open day is a perfect chance to see what a location such as Crondon Park has in store. Think of it as a dry run; the same way you taste dishes before picking the menu or try on shoes to see how they fit. One mistake that brides make is to choose venues based on photos alone. Even when you have testimonials and detailed plans of the whole place, nothing beats seeing it in a wedding setting. You may try to envision how a ballroom looks like with your theme colours and table arrangements, but that may not give the right perspective. Couples fail to factor in that a photograph may present a venue in one way when the reality couldn’t be more different. Going to the open day for venue means that you can see the real thing before putting down that deposit. A venue open day allows you to see what the place actually looks like when it is dressed up for the event. It is an opportunity to note the strongest features of the setting, which is crucial when decorating. You can also copy several decorating ideas that will make the most of the location. Walk around the place to see the facilities available; from parking spaces to washrooms to golf courses. If the ceremony and reception will be at the same location, an open day is a chance to see how to make that work. Venues usually have coordinators whom you can ask questions about the place. Find out if a location allows alterations in case the need arises as you may need to add a dancing floor, for instance. A majority of venues have different suppliers in the industry also attend open days, and that presents numerous opportunities to meet with them. From suppliers to florists to caterers, you can find that missing piece to your wedding planning. The advantage of working with a venue preferred supplier or planner is that you have a reputable reference to vouch for their services. Of course, a credible venue such as Croydon Park will not recommend subpar florists or wedding planning agencies. Imagine the relief of finding the ideal caterer without having to browse online directories or conduct endless interviews. An open day provides a platform to bring up all those nagging concerns. It’s like free consultations in one place from all the professionals you need for your wedding. Make proper preparations when going to an open day like bringing along a camera so that you can capture everything of importance. It’s an excellent way to generate ideas for your wedding shots as you photograph all the best spots. You can take notes to ensure you have the necessary details for reference. Make a list of questions ready before heading for an open day such as the licenses that the venue carries, cancellation policies, registrar privileges and guest capacity.